Welcome to our NEW Digital Store! Now you can buy comincs from your favorite comic retailor digitally! Read them on your iPad, computer, or digital device of your choosing. It doesn't smell as nice as a freshly printed book, but sometimes you need your digital fix. Enjoy! 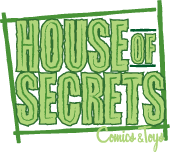 Also, check out Art of Fiction books sold primarily at House of Secrets.